Identification of relevant drugable targets in diffuse large B-cell lymphoma using a genome-wide unbiased CD20 guilt-by association approach. PLoS One. 2018 Feb 28;13(2):e0193098. doi: 10.1371/journal.pone.0193098. eCollection 2018.
de Jong MRW, Visser L, Huls G, Diepstra A, van Vugt M, Ammatuna E, van Rijn RS, Vellenga E, van den Berg A, Fehrmann RSN#, van Meerten T#. Forty percent of patients with diffuse large B-cell lymphoma (DLBCL) show resistant disease to standard chemotherapy (CHOP) in combination with the anti-CD20 monoclonal antibody rituximab (R). Although many new anti-cancer drugs were developed in the last years, it is unclear which of these drugs can be safely combined to improve standard therapy without antagonizing anti-CD20 efficacy. In this study, we aimed to identify rituximab compatible drug-target combinations for DLBCL. For this, we collected gene expression profiles of 1,804 DLBCL patient samples. Subsequently, we performed a guilt-by-association analysis with MS4A1 (CD20) and prioritized the 500 top-ranked CD20-associated gene probes for drug-target interactions. 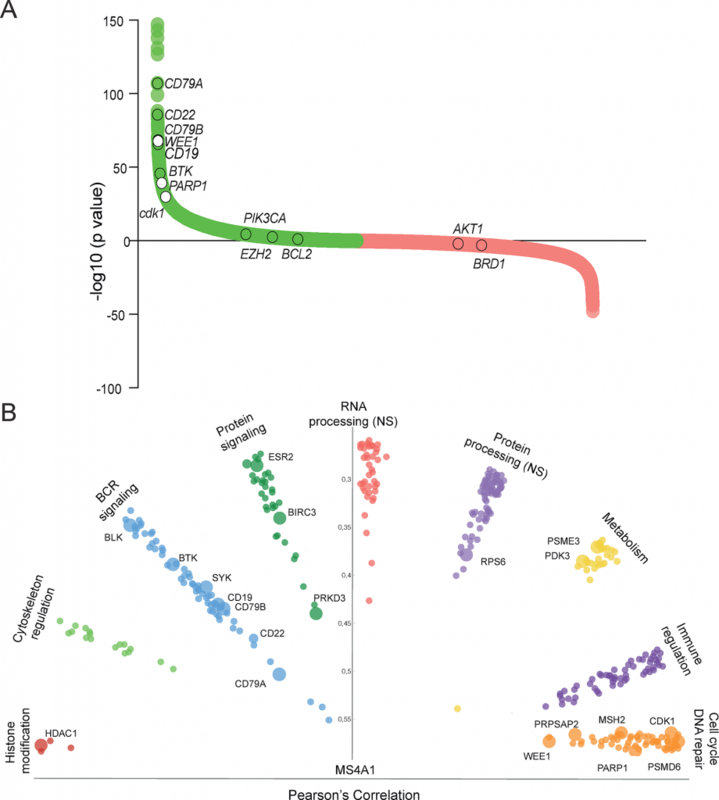 This analysis showed the well-known genes involved in DLBCL pathobiology, but also revealed several genes that are relatively unknown in DLBCL, such as WEE1 and PARP1. To demonstrate potential clinical relevance of these targets, we confirmed high protein expression of WEE1 and PARP1 in patient samples. Using clinically approved WEE1 and PARP1 inhibiting drugs in combination with rituximab, we demonstrated significantly improved DLBCL cell killing, also in rituximab-insensitive cell lines. In conclusion, as exemplified by WEE1 and PARP1, our CD20-based genome-wide analysis can be used as an approach to identify biological relevant drug-targets that are rituximab compatible and may be implemented in phase 1/2 clinical trials to improve DLBCL treatment.